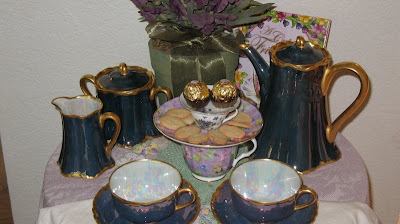 This tea set is so special - it belonged to my Great Aunt Catherine. She painted it by hand in her high school china-painting class!! Isn't that wonderful? Thank you to my Aunts who shipped it to me after my Great Aunt passed away. 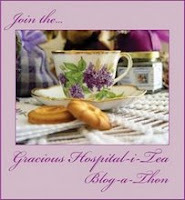 Don't forget to check the other tea settings at Gracious Hospitality. Great experiment and you certainly have a beautiful tea set to work with! Hope that you enjoyed this tea post (I'm a wannabee myself). Thanks for joining us! That tea set is absolutely beautiful. How great that you have such a treasure from your aunt. And you are talented...I can't seem to set up a tea that quickly! Lisa, I'm so glad you joined in this week. It's wonderful that you've discovered the 'tea secret' --- that the event doesn't have to be labor intensive, but can be something simple and easy to share with another. I love your hand-painted tea set. It's absolutely beautiful and how special that it was created by your dear aunt. Thank you so much for sharing with us this week! Great experiment, and your right, it doesn't take much time at all to set up a tea table. I love your tea set. How beautiful. Thank you for sharing. Lisa, Looks like you already have this blog thing down pat! :) Your blog looks wonderful! WELCOME!!! I've only been here about a month now, but I can tell you, it is wonderful! I've met some great ladies, who are kind, encouraging, and inspiring! I've "borrowed" many their ideas for decorating and meals! And it is just uplifting...the fellowship of other Christian bloggers, who share their faith, and life's ups and downs! ...and it is addictive! It seems everyone around me, works outside of their home. So, there is not a strong network OR SUPPORT, for SAHMs. I've experienced guilt and low self-esteem over the years, for not having a "career", even though I felt this is what God had in store for me...and my husband would also like me home, if that is my desire. It's nice to have support of SAHMs and working moms in blogland! Oh, what a lovely lesson for us all to remember! what a gorgeous and wonderful treasure your tea set is! What a lovely tea table you came up with in just a few minutes! Now you really don't have any excuse for not having friends for tea! I love your tea set and the story behind it. Precious memories make it so special! Thanks for sharing and for joining us! Your table is lovely and that is a good lesson for all of us to learn! That set is beautiufl. It is an edwardian chocolate set, isn't it? I am drooling over it! That tea set is exquisite! How wonderful that it's a family heirloom and one of a kind! I'm like you, I've learned that tea can be a very simple affair and we don't have to make it formal or hard to enjoy it. Good for you! You are right - prep time doesn't have to take forever. What a beautiful tea set and what a wonderful story behind it. Thank you for taking the time to set the table for tea and allow us all to come and enjoy! Great post and your tea table looks so inviting. What a wonderful tea set your aunt painted.